ENT for Children offers a wide array of hearing tests for children of all ages. To ensure a correct evaluation, our physician will perform a complete physical examination and will look into the medical history of your child. Some of our hearing tests can be performed on children of all ages, while others are especially designed to meet the age and level of understanding of the child. What hearing tests are performed for newborns? There are two types of hearing tests for newborns that may be conducted in concert when necessary, namely EOAE (evoked otoacoustic emissions) and ABR (auditory brainstem response). In the event the screening determines that the newborn could be suffering from hearing loss, then further investigations will be taken immediately. The hearing loss should be identified before the newborn is three months old. In case a condition is detected, then the treatment must begin before the baby is six months old, a time frame that is critical for the child’s healthy speech and language development. What hearing tests are performed for infants? To measure the hearing capacity of an infant, the audiologist will perform the EOAE. If necessary, an appropriate referral for ABR evaluation will be done. In addition, the audiologist can conduct a behavioral audiometry test to observe the child’s response to certain sounds. What hearing tests are performed for toddlers? EOAE and behavioral audiometry tests can be performed together or separately to evaluate hearing in toddlers. In the event the physician suspects a hearing condition, further evaluation can be done using play audiometry test. What hearing tests are performed on older children? Children of three to four years old can undergo all the hearing examinations that can be employed on newborns, infants and toddlers. If a hearing condition is suspected, then the physician might also use additional tests such as impedance audiometry as well as the speech audiometry and pure tone test. The role of the examination is to discover if the newborn has normal otoacoustic emissions or responses to the sounds. The test implies inserting a tiny flexible plug that emits sounds into the baby’s ear and recording the responses via a microphone. Test is painless and can be performed when the newborn is sleeping. Babies with no responses could be suffering from hearing loss. The ABR test is commonly employed to measure the newborn’s brain activity in response to the sounds. The sounds are produced by a set of electrodes that are attached to the scalp and emit via tiny earphones. Similar to the EOAE, the examination is painless and can be performed when the baby is asleep. What is the play audiometry test? 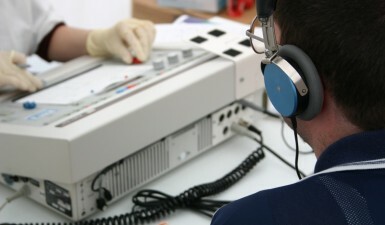 The play audiometry test is an examination adapted to seem like a game. The toddler will receive a toy and will be required to perform a certain action based on the specific sound he hears. To measure the toddler’s hearing, the physician will use an electrical device tuned to transmit sounds or words of different volumes and pitches. Impedance audiometry a.k.a. tympanometry is a common procedure performed to determine the functioning of the middle ear. Even though the test doesn’t help the physician determine whether the child’s hearing is within normal parameters, it’s still useful in identifying pressure modification in the middle ear. The challenging aspect of the examination stems from the fact that the child needs to stay perfectly still. What is the speech audiometry and pure tone test? Given the more advanced age of the child, the test has been slightly modified to appear like a game. The examination relies heavily on the child’s cooperation and entails asking him to perform a predefined action upon hearing a certain word or sound. The sounds and/or words are transmitted via an electrical machine capable of altering their pitch and volume. If you suspect your child is suffering from a hearing problem, contact ENT for Children today for a clear diagnosis by Dr. Daniel Samadi.